Hey, we told you it was awesome. 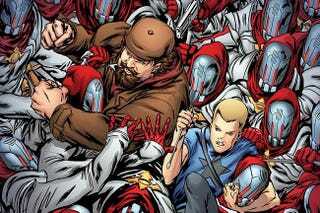 Valiant's comic about a superpowered kid assassin who escaped his parents' religious cult bent on taking over the world and his immortal hedonist buddy has been fast-tracked for the movies, according to AICN. They don't mention which studio is doing the fast-tracking— all they say is that a script based on Fed van Lent'e reboot of the comic is finished, and Valiant loves it — but I hope it's true anyways. If only so more people get into the comic.